about 75% of our radishes have been getting eaten. both the radish itself and the leaves are chewed up. anyone know what this could be and how to prevent it? we've been planting for about 3 years now and have never had any trouble at all with radishes. we moved to a different house this year, same city, just about 10 miles south of our old house. it's weird how such a short distance can completely change your garden and how different things affect it. Possibly two or more insects or worms that are eating your radishes. I have the same problem here. Try dusting them with diatomaceous earth. It is good to dust the furrow you are planting the seed in the day you plant too. Plant again. 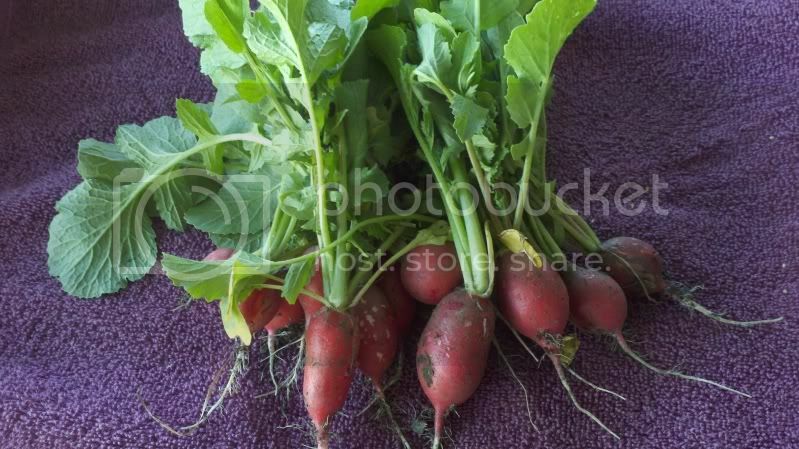 If you keep them watered well radishes do quite well even this late in the season. They really are a cool weather plant, but I have had good luck with them through June. some of them actually look like they have little teeth marks on them. please tell me there's no possibility of this being mice or rats. Jugged leaf edge can easily be slugs. I picked these the other day when I went out just to thin them out but got surprised by how big they were already. I have had problems with a chipmunk eating mine untill oneday I was watching out the back window and saw it get picked off by a hawk! Glad the hawk got it before a BB! I wonder if the hawk thought the chipmunk tasted like radish? What do YOU do with radishes? ?